Looking at the graph it seemed to me that the rate of sealevel rise had increased since 1999. Therefore I fitted the data in four different ways, assuming an error estimate for the individual points of 7mm. 1)a linear fit to all the data as in the colorado graph above. My results agree with the 2.8+/-0.4mm/yr figure from University of Colorado as I obtained 2.8+/-0.6mm/yr. 4)just for fun an exponential fit to all the data: y=a*exp((x-1992)/tau)+b This fit gave tau=11+/-2yr at the time constant tau of the exponential. Both the linear and the exponential fits had roughly the same chi-square indicating that the available data cannot really distinguish between a linear increase in sea level and an exponential one. It may be of importance that the chi-squares error estimate for rate of sea level increase in the linear fits 2 and 3 are smaller than that in the linear fit 1 (the Colorado fit). This seems to show that the data has some preference to being fitted with two piecewise linear sections than one straight line. Details of all the fits are at the end of this page. 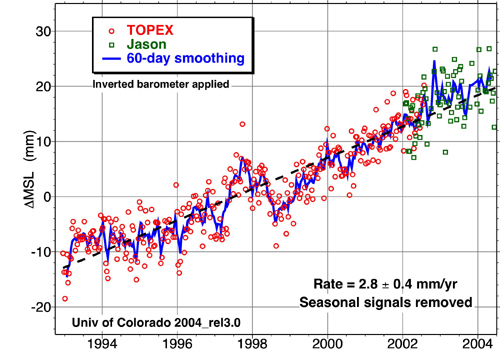 The image above is a graph including the data and the fits.The red line is a linear fit to the data from 1992 to 1999. The green line is the University of Colorado fit to all the data. The blue line is a linear fit to the data from 1999 through 2004. The purple is the exponential fit to all the data. It seems clear that the data is rising above the red line (linear fit from 1992-1999). I have extrapolated (yes, I know, one of the Cardinal Sins) the lines out to 2020. If the sea level continues to rise in a linear fashion, it seems that we may expect sea level rise of between 40 and 55 mm (1.6-2.2 in.) above present sea level in 2020. Bearing in mind that an average beach gradient is about 1%, this translates into shorelines moving inward by 4 to 5.5 m (13 to 18 ft.) by 2020.